Heat oven to 375°F. Line 2 baking sheets with foil. In medium bowl, stir cookie mix, butter and egg until soft dough forms. Divide dough into 3 portions. With fingers, press each portion of dough into large egg shape (7x5 inches and 1/4 inch thick), 2 on 1 pan and 1 on other pan. Bake 10 to 15 minutes or until golden brown; cool completely, about 30 minutes. Stir food colours into portions of frosting as desired. 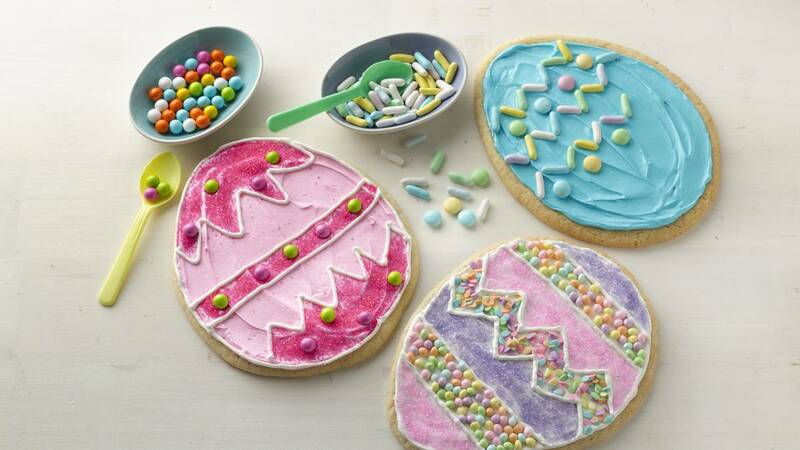 Decorate Easter egg cookies with frosting and candies. You can bake the cookies the day before the fun begins! Store cookies covered with plastic wrap or foil. Chocolate chip cookie mix can be substituted for the sugar cookie mix. Stir some chopped nuts into the dough for an indulgent treat. Try a variety of sugared gumdrops, candy-coated sunflower nuts and cinnamon candies for fun designs and colours.